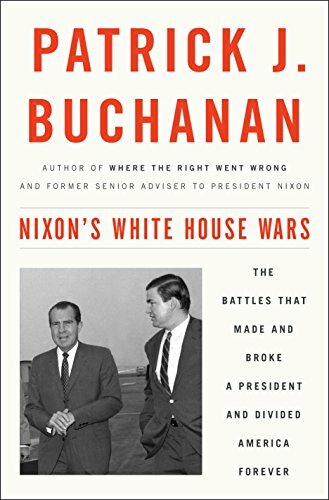 Patrick J. Buchanan’s Nixon’s White House Wars is part memoir, part history, and part commentary on his years as a Nixon loyalist and aide in and out of the White House. It is a fascinating look inside the Nixon White House during the tumultuous years of Vietnam and Watergate. As a young editorial writer for the St. Louis Globe-Democrat, Buchanan signed on with Richard Nixon’s presidential campaign team in 1966. He traveled with the future president to 35 states in six weeks as Nixon campaigned for GOP candidates for House, Senate, and state legislative seats. Nixon’s decision to campaign for GOP candidates throughout the country, Buchanan believes, resulted in his getting the party’s nomination for president in 1968. Buchanan joined the Nixon administration as a special assistant to the president, with an office in the old Executive Office Building. He wrote speeches for Nixon and Vice-President Spiro Agnew and summarized daily news stories for the president, but also had input on policy and political decisions. The “wars” of the Nixon White House included clashes with an increasingly adversarial and liberal press, a vocal and influential counterculture, black radicals, college campus anti-war protestors, disgruntled conservatives, and internal power and ideological struggles among the president’s staff and advisors. Buchanan fought within the administration on the conservative side of the struggle. In hundreds of memos—many of which are partially reproduced in the book—Buchanan consistently urged the president to implement conservative policies in both foreign and domestic affairs. Nixon, however, was not a movement conservative, but rather a pragmatic politician with conservative instincts. That was not good enough for Buchanan. Nixon refused to rollback Great Society domestic programs, and even expanded some. He appointed moderates and liberals to key positions on the White House staff and in the Cabinet. Nixon’s landslide victory over George McGovern in the 1972 election is often attributed to a “Southern strategy” in which the campaign united Southern segregationist supporters of George Wallace with traditional GOP voters. Buchanan reveals another, perhaps more important, part of that historic campaign: the Catholic strategy. Buchanan and others within the administration urged Nixon to appeal to Catholic Democrats whose religious and social beliefs, and commitment to a strong military, were increasingly under attack by the left wing of the Democratic Party. This produced important and lasting results. Buchanan notes that Nixon’s share of the Catholic vote increased from 33 percent in 1969 to 55 percent in 1972. “In nine presidential elections from 1980 through 2012,” he writes, “the Republican nominee would average 46 percent of the Catholic vote.” Donald Trump in 2016 won 52 percent of the Catholic vote. Buchanan accompanied Nixon on his historic trip to China. He sought to convince the president to win the war in Vietnam instead of settling for stalemate like Truman and Eisenhower did in Korea. He lauds Nixon’s decisiveness in airlifting supplies to Israel during the 1973 war, and ordering a nuclear alert to deter the Soviets from intervening in that war. He urged Nixon early on to abandon the Watergate burglars and anyone in the administration who sought to cover-up the crime. He later recommended that Nixon burn any tapes that had not been subpoenaed by the Watergate special prosecutor. Despite the president’s failure to implement the conservative agenda, Buchanan remained a Nixon loyalist to the end. He considers Nixon “the most influential political figure of his time.” He lauds his post-presidential comeback during which Nixon wrote important and influential books on foreign policy and became a trusted advisor to most of his successors. Buchanan subsequently worked for the Reagan administration, and ran for president twice in the 1990s and again in 2000. Since then, he has continued to write books and articles on important issues facing our country. He is a brilliant polemicist and a keen observer of the culture wars that began in the 1960s, raged throughout the Nixon years, and that still bedevil our nation.